At City Observatory, we’ve written quite a bit about the phenomenon of city center job growth. We did a whole CityReport about the phenomenon, showing that since the Great Recession, urban cores have been outperforming the rest of their metropolitan areas on employment, reversing earlier trends. And just this week, we covered new job numbers showing that larger metropolitan areas—those with at least a million inhabitants—are growing more quickly than smaller ones, and that those regions’ center cities are growing more quickly than their suburbs. Why do we care about this? Well, for one, we’re partisans for cities, so that makes us happy. But even if you’re not, there are major benefits to re-concentrating jobs in and around downtowns. And in large part, they have to do with access. Recall from one of our earlier posts that in many places, suburbanites who take public transit to work are actually richer on average than suburbanites in the same neighborhoods who drive. Why is that? Because in places where high-end jobs are concentrated downtown, those high-end earners can take convenient express buses or commuter rail to work. In contrast, lower-end service workers, whose jobs are scattered around the region, don’t have that option, because suburb-to-suburb transit is often infrequent, slow, and unreliable. In fact, we can demonstrate that, in many places—particularly those with decent express buses or commuter rail serving their downtown—job location actually matters more than home location in determining how people get to work. That’s very different from how we normally think about the kind of person who takes transit and the kind of person who drives: we generally imagine that the former must live in a relatively dense urban area, and the latter probably lives in a more outlying, suburban one. But while those correlations are true, if the urbanite works in the suburbs, she almost certainly drives; and if the suburbanite works downtown, there’s a good chance he takes the train. Using data from the 2013 American Community Survey, we’ve put together a few maps that show this. The ACS tracks “mode share” (how people get to work) both by home location and work location. In the “home location” map, transit use is heavily concentrated in central cities, but you can see elevated levels of use in a handful of suburbs, too, often along express bus or commuter rail lines. 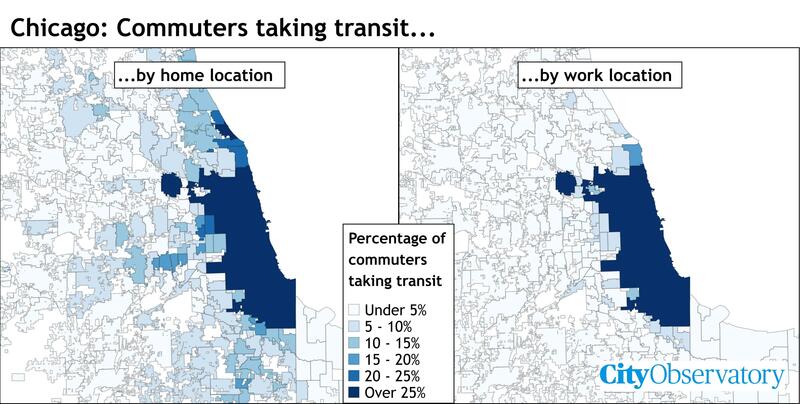 In the “work location” map, however, almost everywhere outside the center city goes blank: virtually no one uses transit to get to jobs in the suburbs, even in “transit-rich” regions like Chicago or Philadelphia. The darkest city in both maps is Minneapolis. Just to its right is St. Paul. Note that this data comes from before the opening of the Green Line light rail to downtown St. Paul. This principle—that what really matters for how you get to your job, even more than where you live, is where you work—is a big reason that growing employment in city centers benefits everyone in the region, even if they’re planning on remaining in an outlying neighborhood or suburb. (And, importantly, we can extend that principle to other destinations: grocery stores, schools, and so on. What matters is “destination density” near transit.) Creating the option to get to your job via transit does several important things: by reducing driving, it reduces the number of serious accidents, injuries and deaths; it reduces greenhouse gas emissions and pollution; and it dramatically reduces transportation costs, giving households more room in their budgets for other important expenditures. And as a bonus, transit use helps keep the metropolitan footprint smaller. Those are things that benefit you no matter where you live in a metropolitan region. They offer a lesson for cities, which ought to make the most of these dynamics by zoning more land for a density of jobs, amenities, and other destinations near central transit stations. And it’s part of why we’re cheering on the return of center cities as the engines of America’s job growth.